Although we raise money through enterprises such as the Rare Breeds Centre and by selling things we grow or make, we still depend hugely on donations to continue and expand our work. Please think about supporting us - your money will be warmly appreciated and wisely spent. The best way of supporting us is to set-up a regular donation by direct debit which enables us to plan our work effectively. 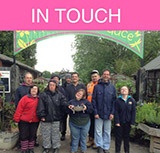 Donate now and help us support adults with learning disabilities get the support they need. Click here to view other ways to Donate. £500 could help to develop communication skills for those with complex needs and impaired speech abilities through the purchase of specialist computer equipment.